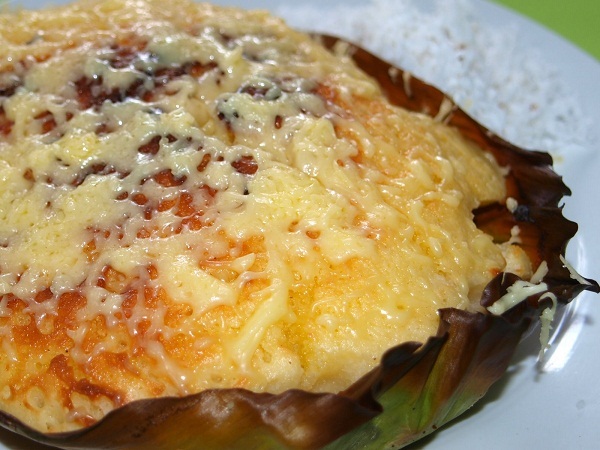 Bibingka Galapong is a coal-steamed rice cake made out of ground glutinous rice, water, & egg. It is cooked on a clay pan that is lined w/ banana leaves, for the aroma, then topped with salted egg slices. Preheated coal is placed both at the top and at the bottom of the pan to cook thoroughly. It is best served w/ butter & coconut shreds. Warm, soft, & fluffy is the supreme qualities of good bibingka galapong. The salted egg gives another notch of complimenting flavor and texture of the bibingka. In some places in the Philippines you can buy bibngka during midnight masses (simbang gabi). Here's the recipe in making a delicious bibingkang galapong.